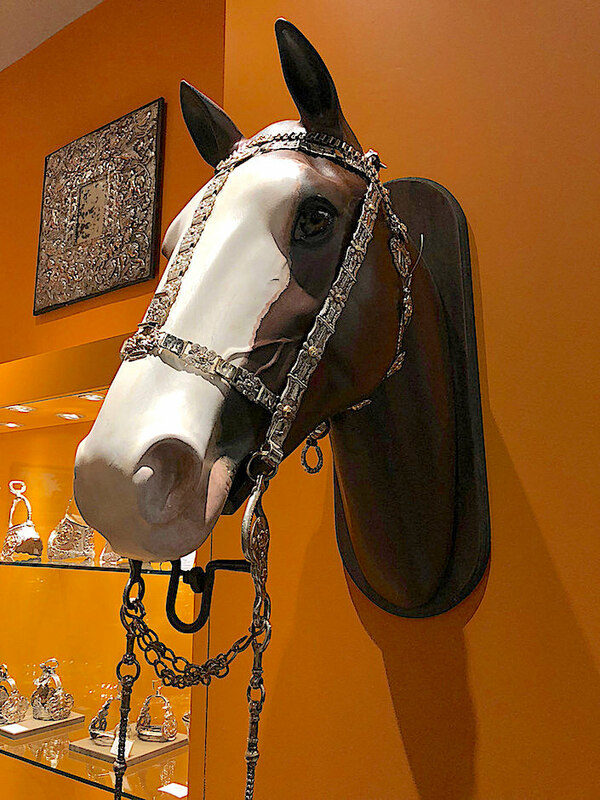 The number of highly selective dealers and quality of their pieces made it challenging to cover the TEFAF New York Fall show in a single post. Hence, I am back today with more picks from this year’s supremely elegant edition. 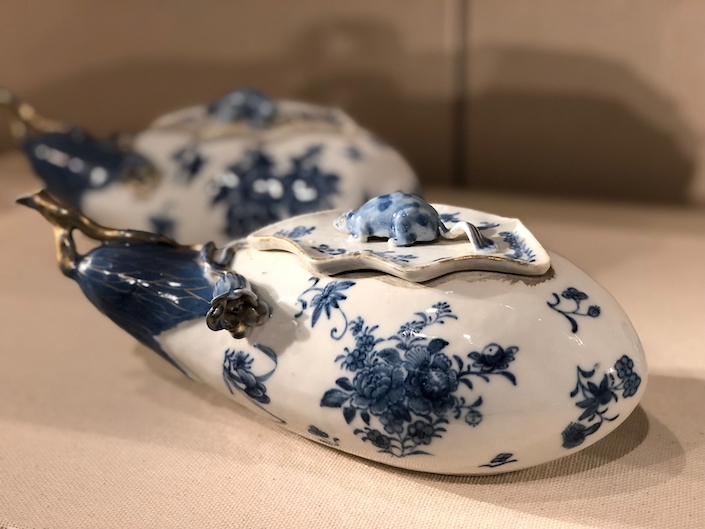 Aronson always presents the most beautiful Delftware. This year they are showing a pair of blue and white bowl and cover flower vases – one above. Dating to c. 1695, they hail from the prestigious De Grieksche A factory from which William and Mary (King William III and Queen Mary II) commissioned all their delft. Only three such examples exist. In the last post, I shared a magnificent set of large peacock plates from Jorge Welsh. 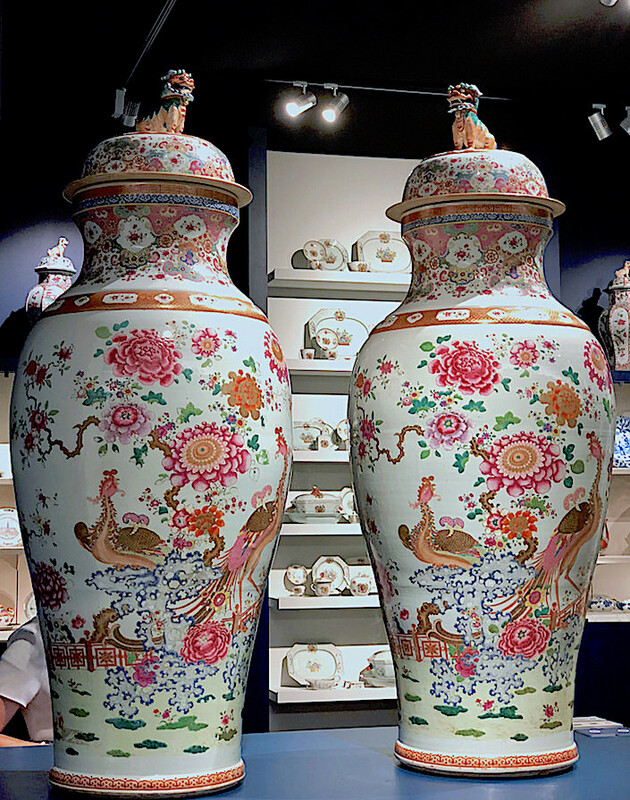 Other items in his booth I admired were an enormous pair of Chinese Qing dynasty (1736-1795) Famille Rose ‘Soldier’ Vases with Covers, above, and an unusual pair of eggplant shaped tureens with wonderful details from the same period. At Michele Beiny, a tureen of another sort made quite the impression. 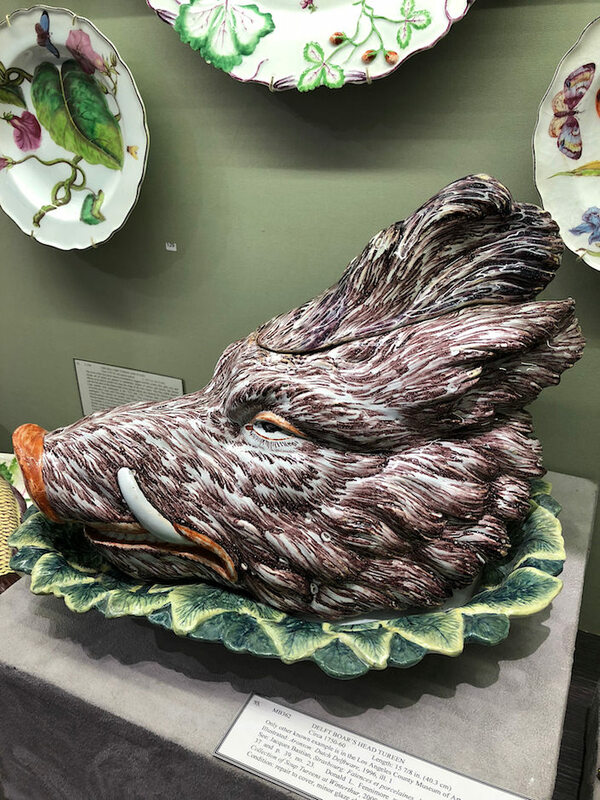 A Delft Boar’s Head from circa 1750-60 is one of only two known examples. While the artistry is amazing, it shows how much our gastronomy has changed over the last several centuries! 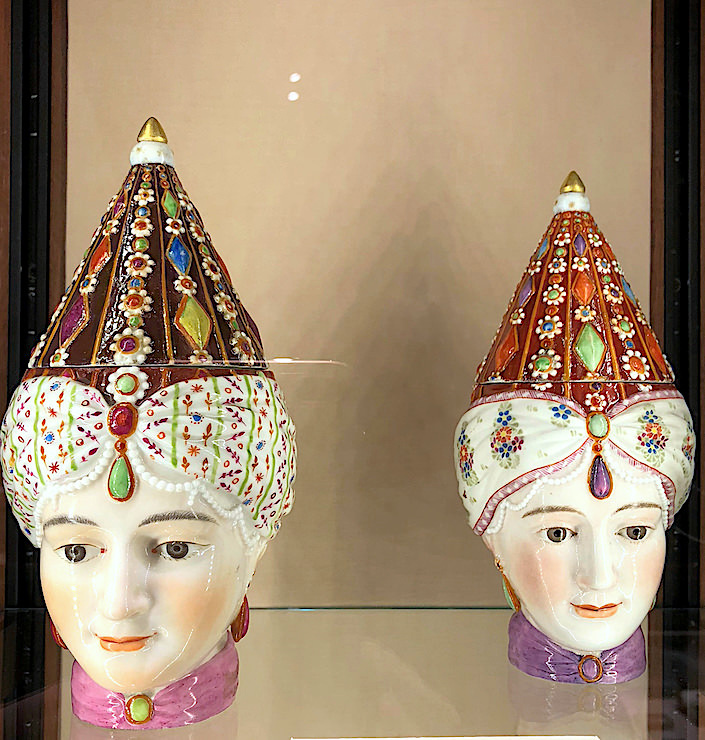 The craze for Turquerie can be seen in these two small ceramic tankards at A La Vieille Russie in the form of Turkish ladies’ heads with jeweled headdresses from 1770-1790. 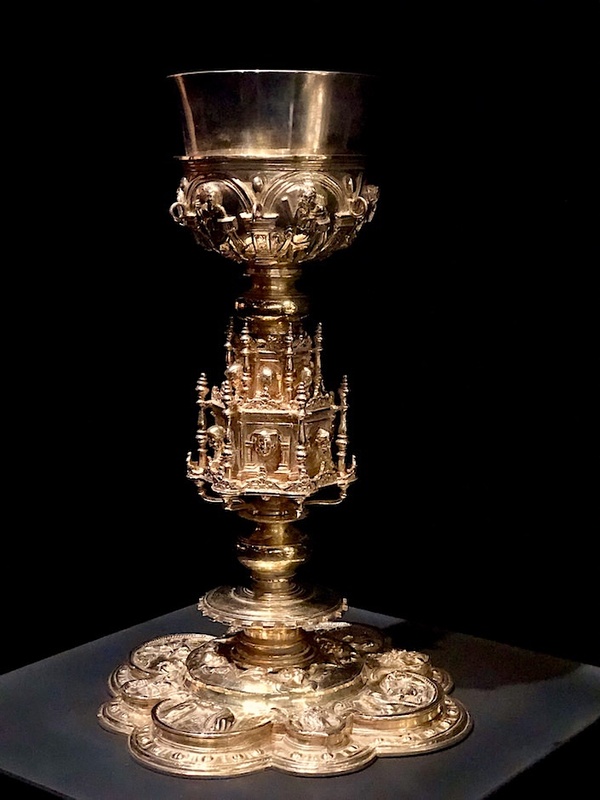 And as far as vessels go, this gigantic gold plated chalice from 16th century Mexico City at Jaime Eguiguren, is a marvel in ornate workmanship. 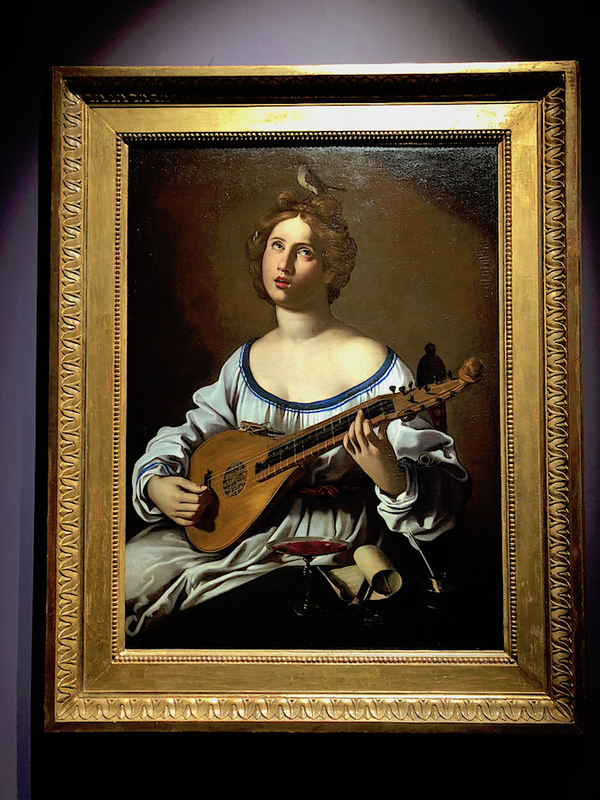 They also are showing the Antiveduto Grammatica Allegory of Music, beautiful with its baroque symbolism and Caravaggio-inspired chiaroscuro. 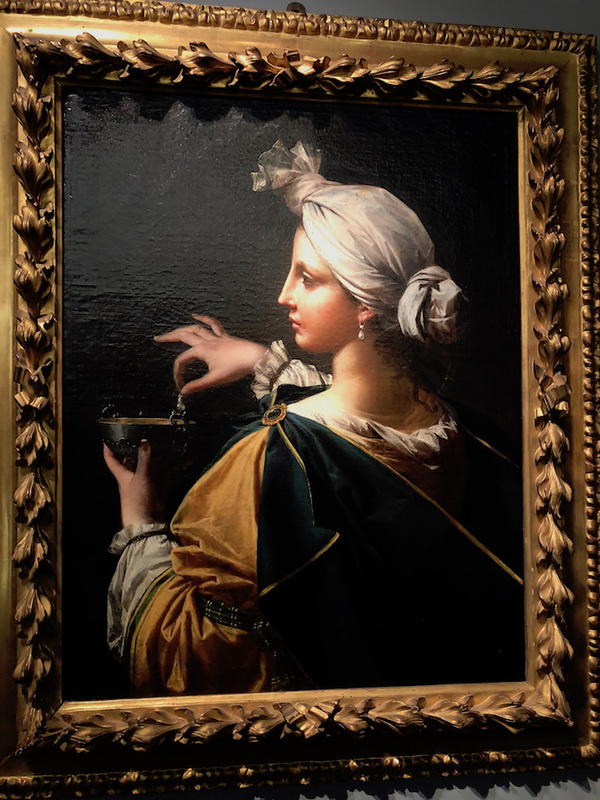 And while not an allegory, the story of Cleopatra dissolving the pearl is portrayed in Donato Creti’s masterful portrait at Moretti. For those not familiar with the tale, Cleopatra had made a wager with Marc Anthony over who could consume the most expensive meal. 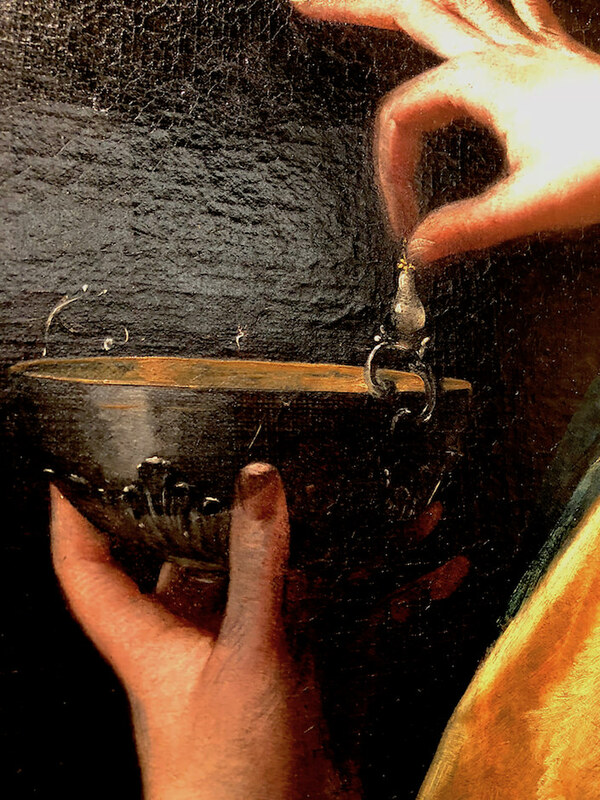 She ordered a vessel of vinegar, took off one of her earrings (worth a veritable fortune) – the detail below – watched it dissolve and then drank the liquid, thus winning the bet. 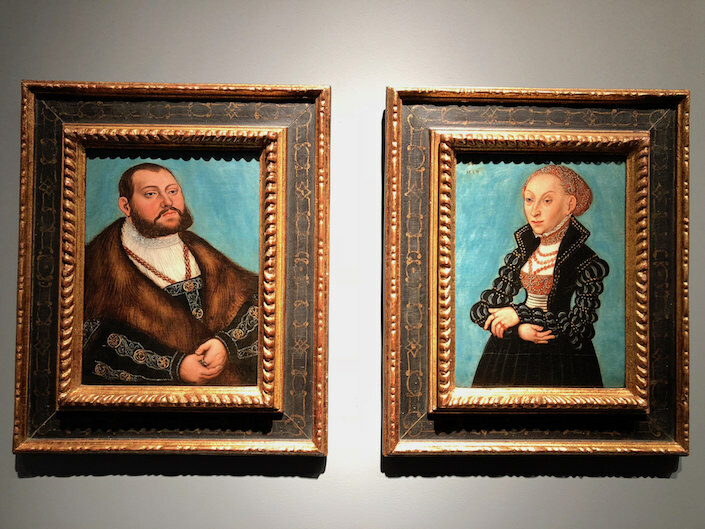 You may find these portraits look somehow contemporary but they are the work of celebrated German Renaissance painter Lucas Cranach the Younger showing at De Jonckheere. 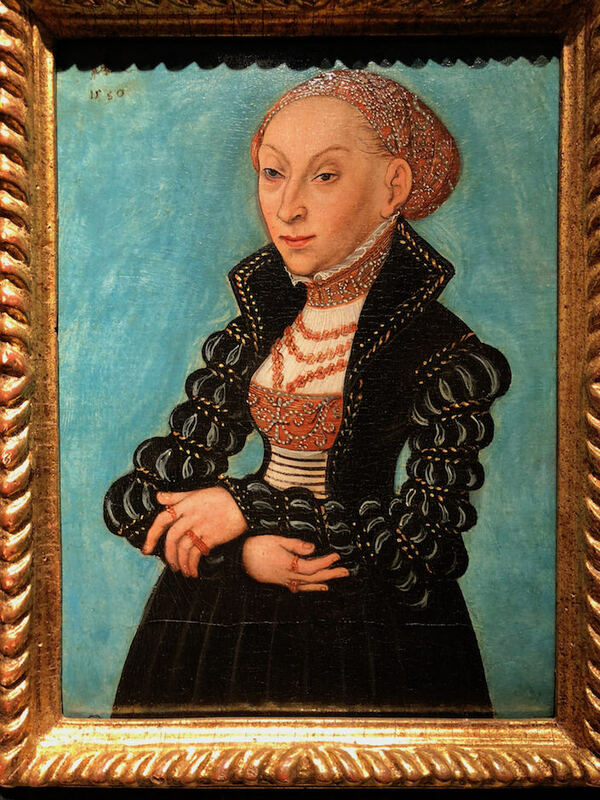 Trained by his famous father, Cranach the Younger employed vivid colors, attention to fashion and a relaxed, stylized approach to portraiture that lends it a more modern feel. 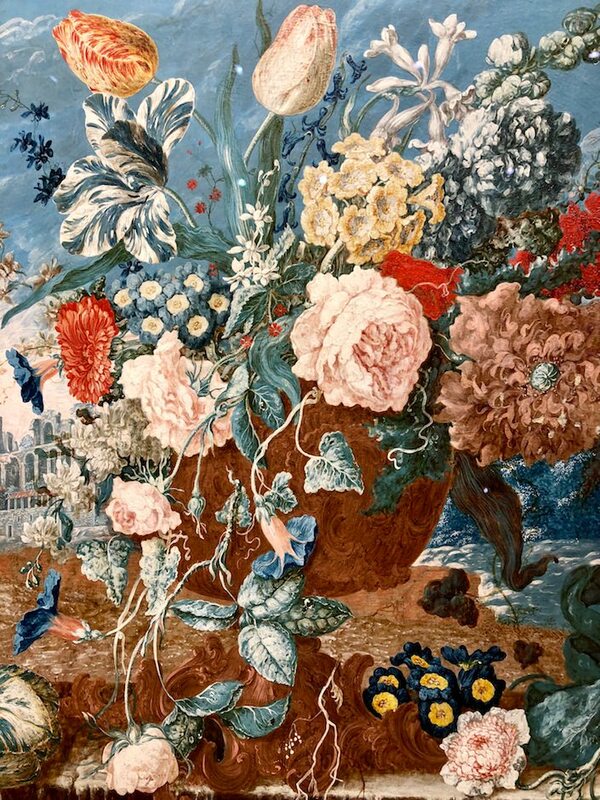 Many 20th century artists, from Picasso and Warhol to Otto Dix and others have found inspiration in the Cranachs’ style as well as entrepreneurial skills (not unlike another northern Renaissance master Pieter Coecke van Aelst). I’m sure you wouldn’t be surprised if I told you John Currin was a fan. 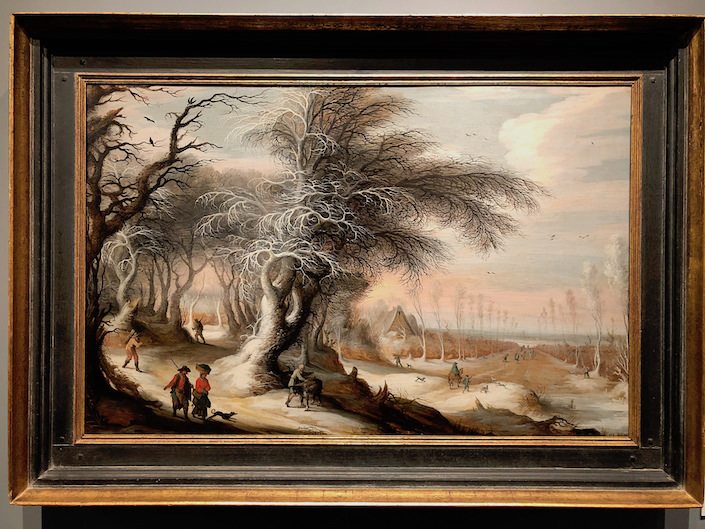 Another northern Renaissance painting at De Jonckheere worth noting (there are obviously more than one) is this “Winter Landscape Animated with Villagers” from Gijsbrecht Leytens. 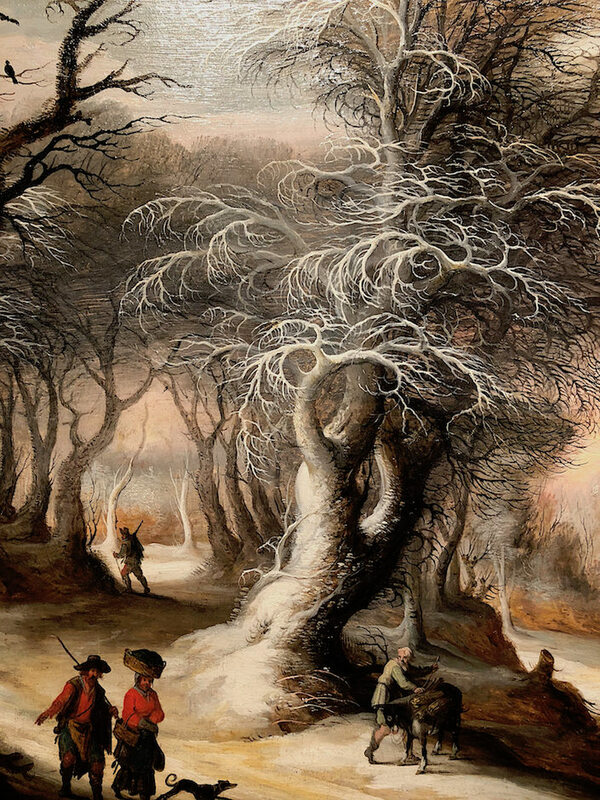 Known for his winter landscapes, Leyten’s details are breathtaking. 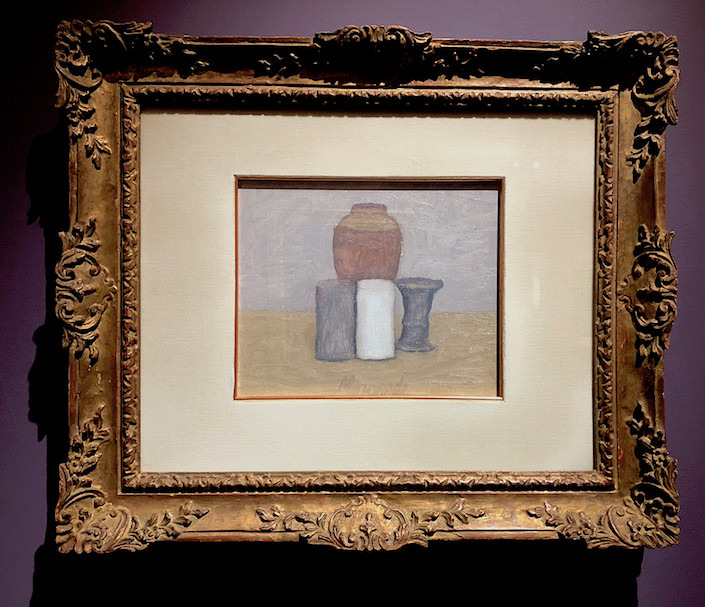 In terms of 20th century masters, a favorite was this Morandi at Robilant + Voena. From 1961, his careful composition, subtle coloration and subject matter elevated the everyday to a celebrated art form. 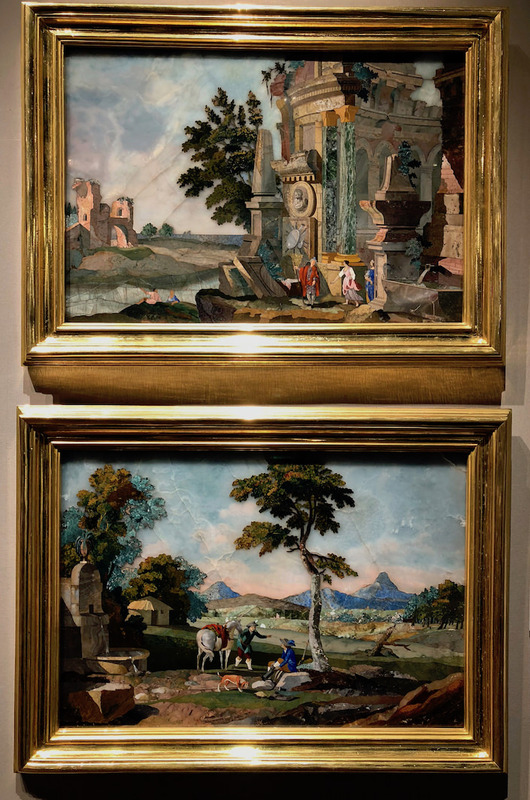 Stroll by these beautiful scenes at J. Kugel and you may think they are paintings. 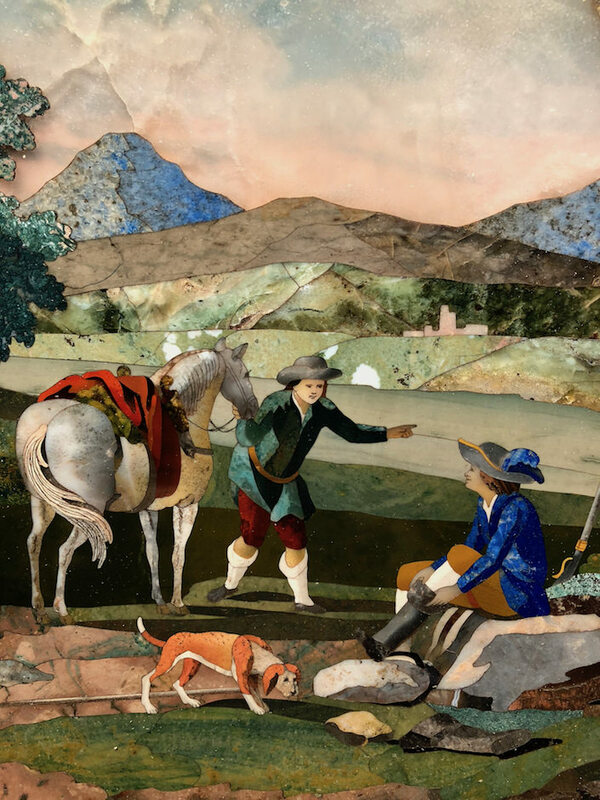 But look closely and you will see the astounding workmanship in this pair of mid 18th century Italian pietra dura marquetry panels commissioned by Emperor Francis I from the Opificio delle Pietre Dure in Florence. 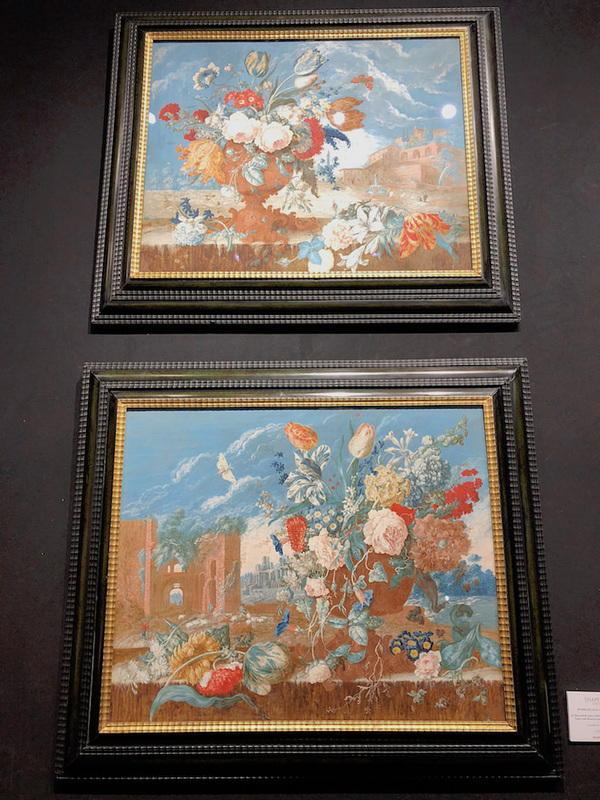 At Shapero Rare Books, I loved this pair of Dutch still lifes attributed to Jacob Rysbrack circa 1740. In gouache on vellum, the colors and movement are enchanting. 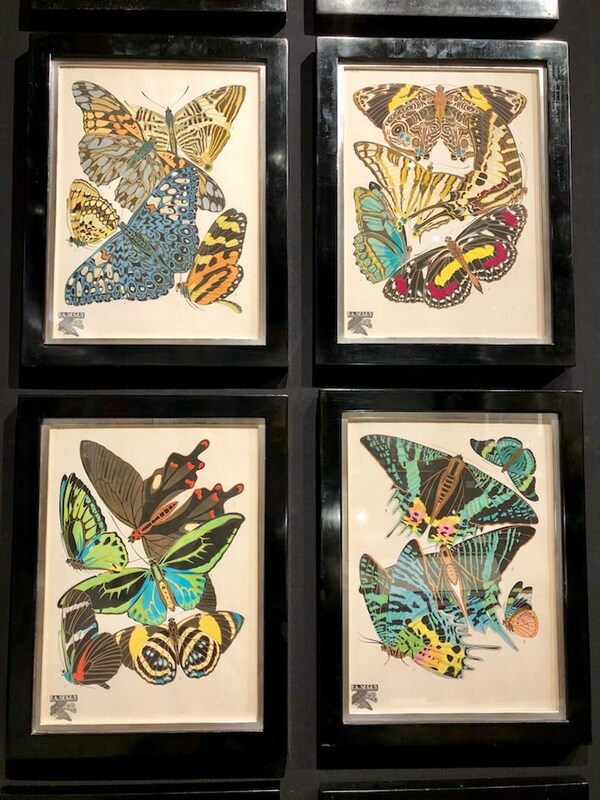 A rare book booth is a magnet for me and I was also drawn to this Seguy set of Papillons hand colored lithographs, circa 1929. 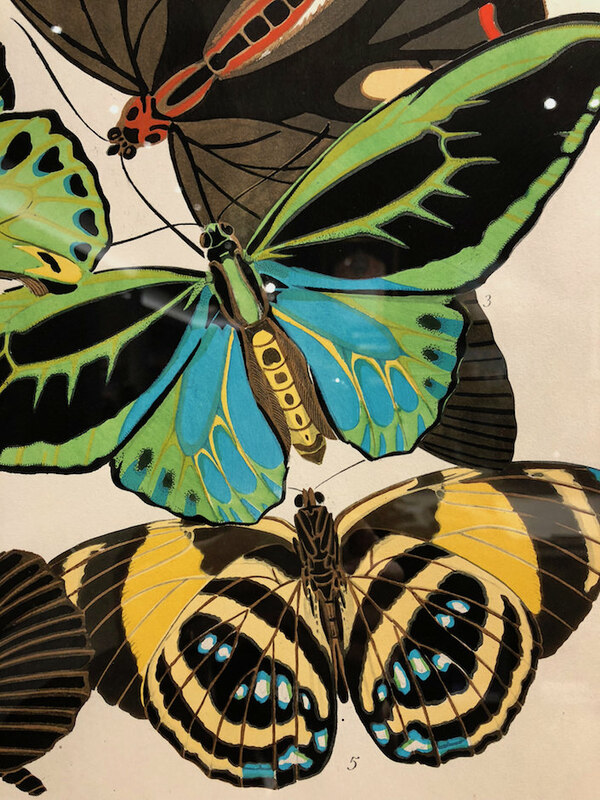 While you often see imitations, these brightly colored graphic delights from the famous French Art Deco entomologist/artist are the real deal. This one is for my sister who loves all miniatures starting with the dollhouse my father made her. This miniature tea house at A. Aardewerk is a tiny replica of one (that still exists) built in 1672 in the garden of the mansion in Amsterdam where the Waldorf Astoria hotel now stands. 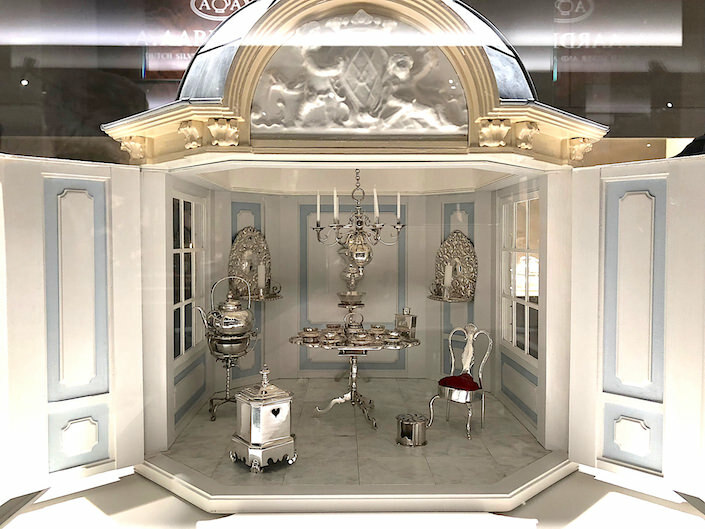 This contemporary confection has a real lead dome roof and is furnished with 18th century antique silver miniatures all made in Amsterdam. More sterling accessories were seen at Eguiguren. 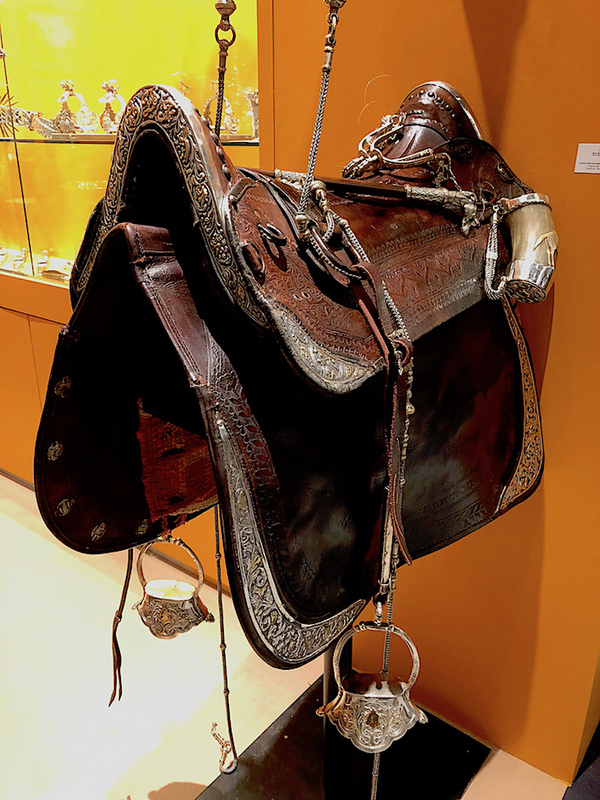 Here form meets function for those who wish to ride in style with luxurious 18th century silver and leather equestrian gear from Uruguay. Of course my coverage wouldn’t be complete without a quick peek at some of the jewelry at the show. 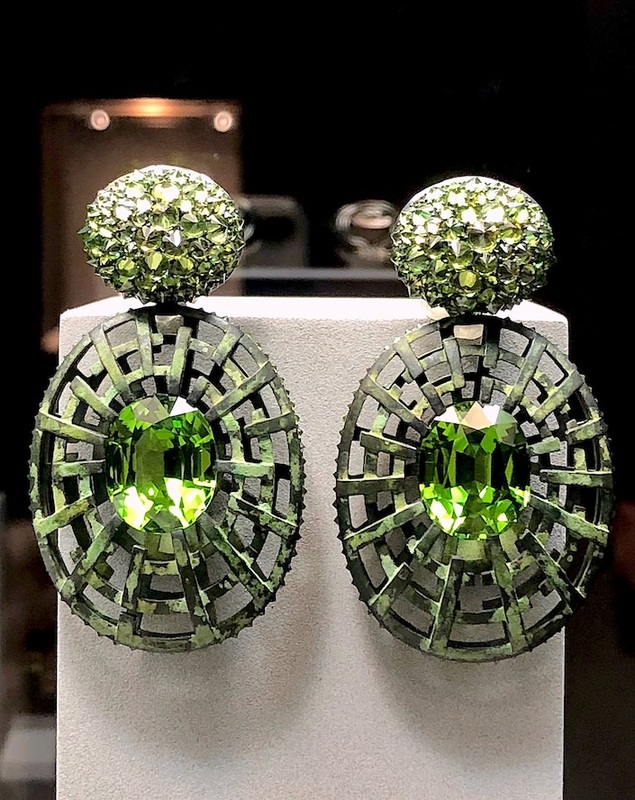 Hemmerle is always a favorite and these spectacular peridot, demantoid garnet, silver and white gold earrings were calling my name! But I wouldn’t say no to these stunning aquamarine, turquoise, onyx, silver and white gold creations. 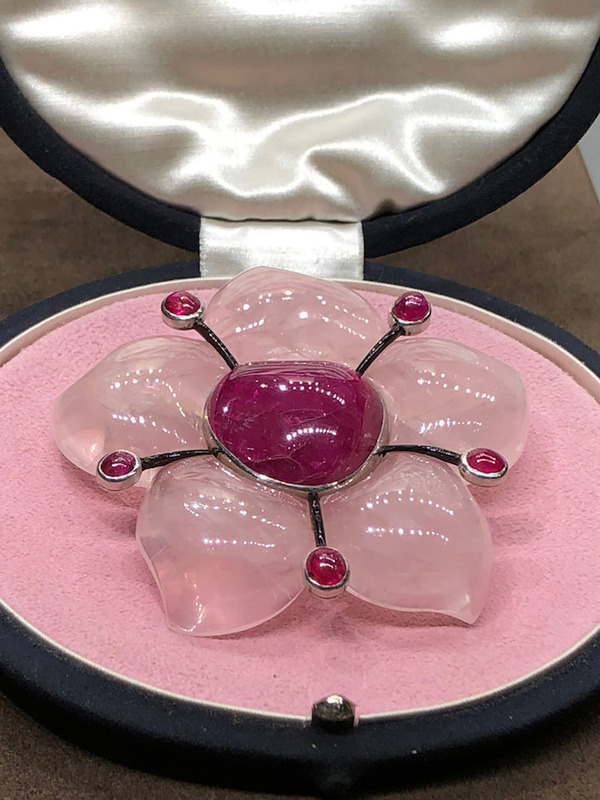 as well as a Belperron (my visit to the jewel box boutique here) ruby, rose quartz and enamel “Fleur” Brooch from 1936. 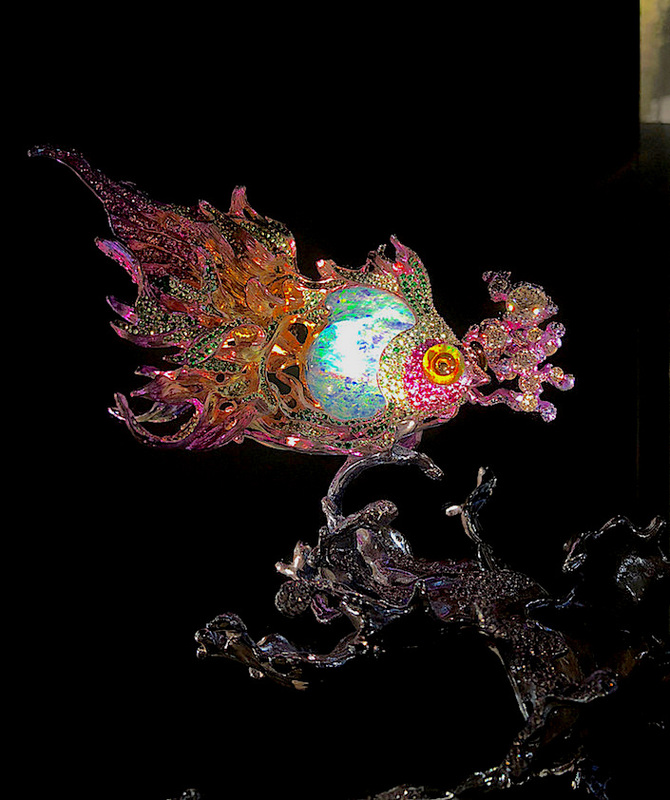 And lastly, you won’t want to miss modern master Wallace Chan‘s other-worldly booth where his masterpieces dazzle. 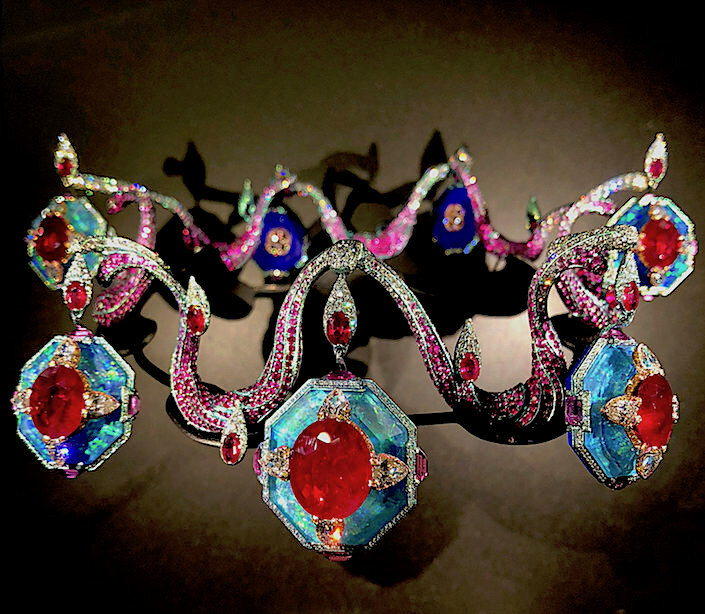 His Sea of Joy Brooch, from a single piece of opal is combined with crystal and gemstones with his patented techniques. 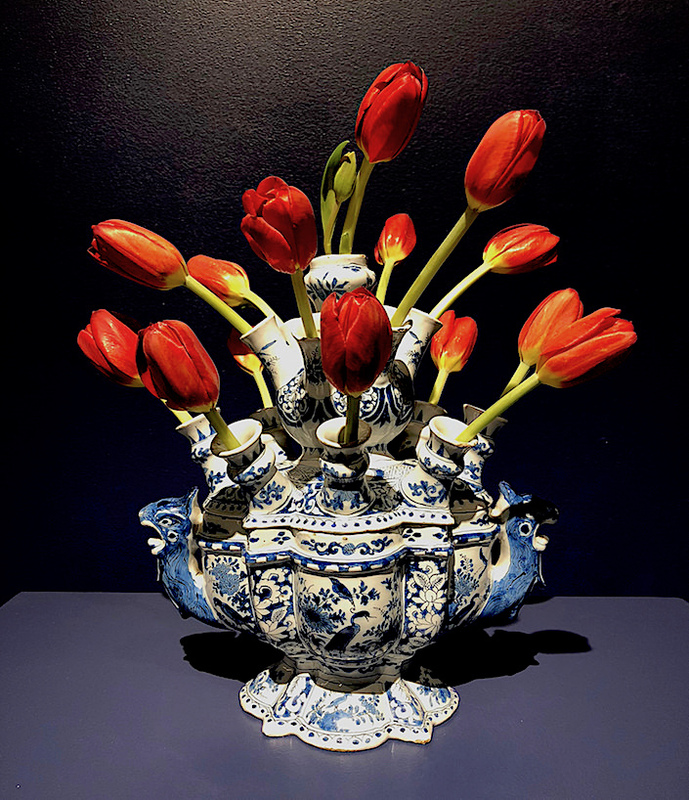 Showing at the Park Avenue Armory (643 Park Avenue), TEFAF New York Fall will be open through Wednesday, November 1, noon (11 am for VIP ticket holders) – 8 pm (6 pm on Sunday and Wednesday) with a coffee talk on an interesting art-related topic each day. 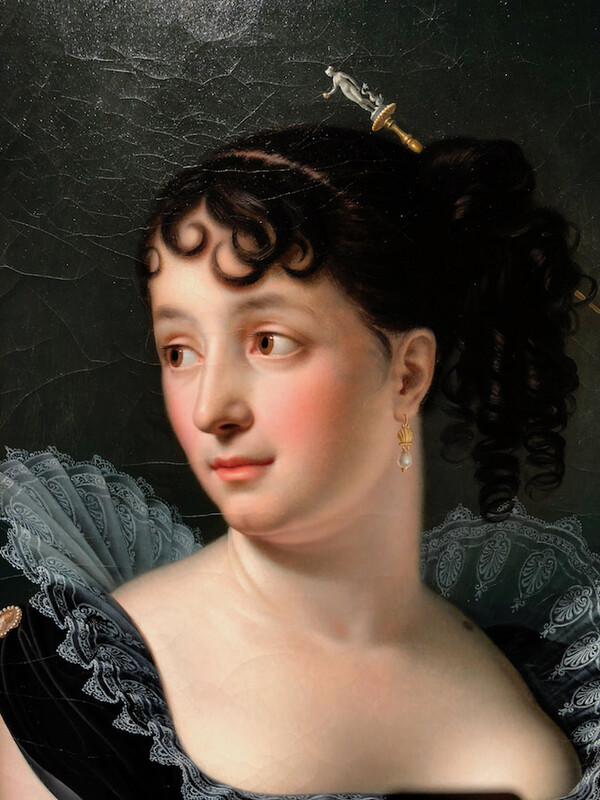 If you are interested in the fine and decorative arts, you owe it to yourself to make a visit. 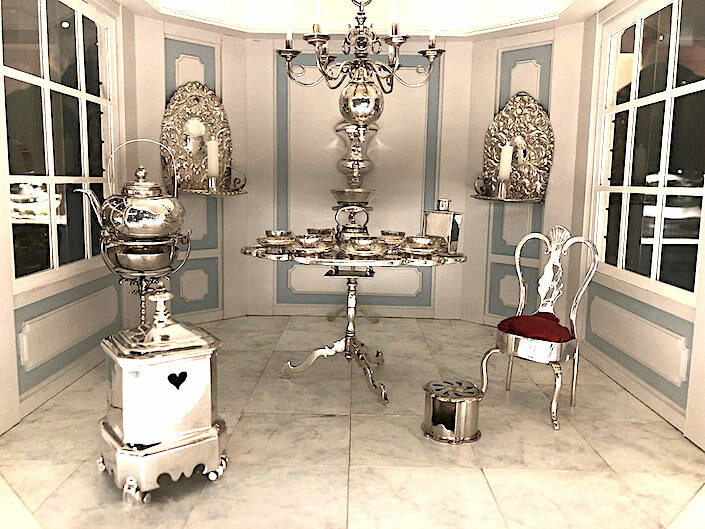 This entry posted in art, art history, interior design. 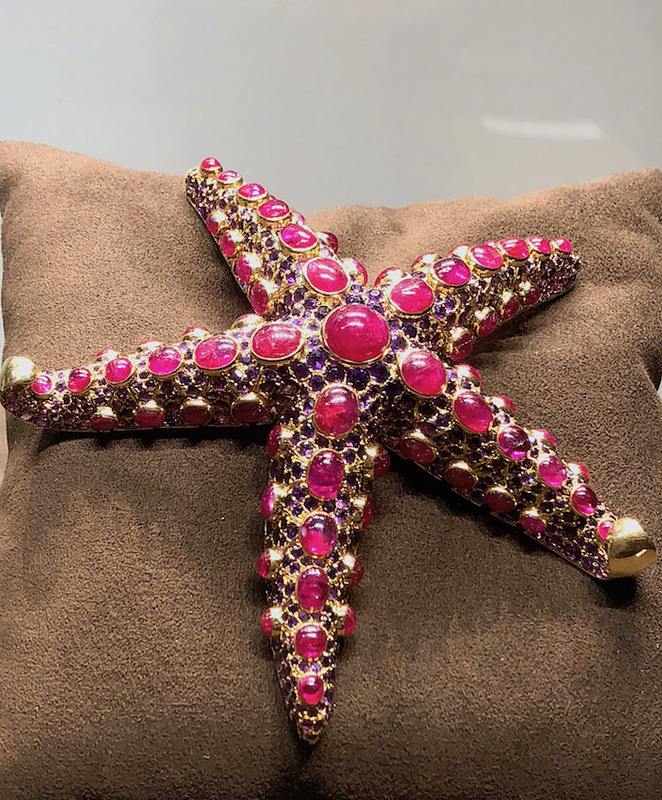 Entry Tags: art, art fairs, decorative arts, Jewelry, paintings, Porcelain, TEFAF, TEFAF New York Bookmark the permalink. 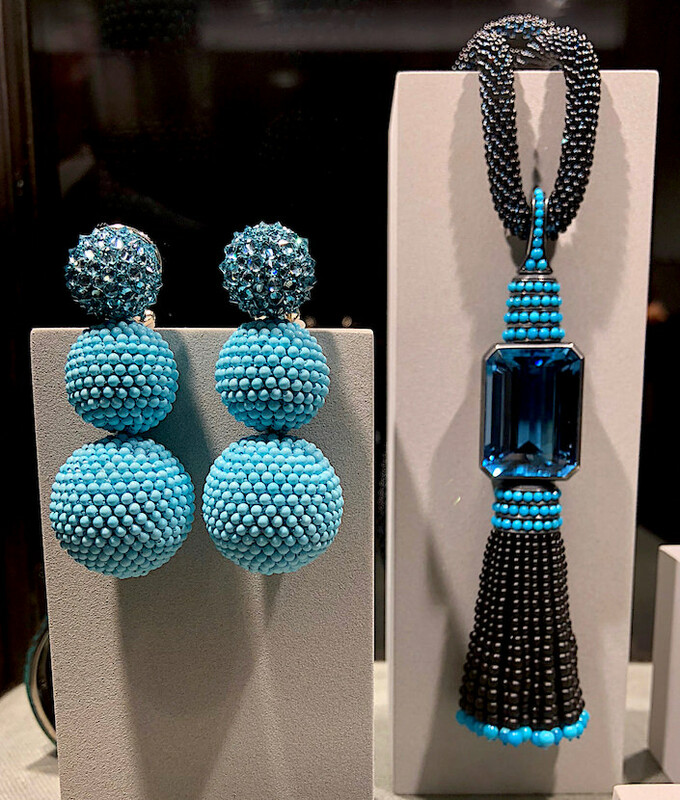 How much like the turquoise and aquamarine earrings are Rebecca de Ravenel’s “bon bon” earrings !!! Part l and PartII—a total delight. I’m on my second tour. Thank you!